When a housewife has clothes sorting, filing, banking, possibly writing an insurance policy for the choir and treating the dog for yeasty ears on her to do list, her thoughts naturally turn to beading. I actually have some commission work to do, but it’s stuff I’ve done before only in different colours and anyway, I have until Monday. I feel like making something new. 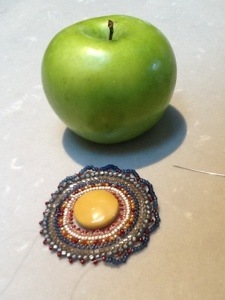 The apple is for size comparison, and because it is a lovely contrasting colour. I’m not totally convinced about the mustard coloured gemstone bead in the centre, but it’s a pretty good fit. The edge isn’t finished because I had the family demanding dinner, so I photographed it to blog about later tonight. Then they went in the pool. The pattern is from the December 2010 Bead and Button magazine, and I’ve had my eye on it for a while. I’ve not done flat herringbone before, it worked up quite quickly. For those also attempting the pattern, I found that fifty six units wasn’t enough, I had to go for sixty. Also, I didn’t have size eight hex cut beads, but 1.5mm cube beads fit very nicely and still have a contrasting shape. This pattern is a keeper, I’m looking forward to making some in different colours, perhaps next time I have a Treasurer’s report due.